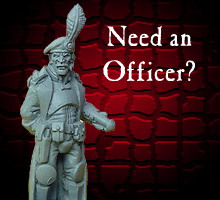 Heresy Miniatures Ltd , - Pledge Manager Store - Pledges shipping as and when figures are ready! For more information, click here. or read the Privacy page. This is the Pledge Manager Store for the Heresy KickStarter 'Return Of the Monsters!' from September 2014. This store is for Backers to work out what they wanted from their Pledges or for new backers to put a pledge through. It was open from February 2015 until October 2015 for Kickstarter Backers to manage their pledges with, and after half a dozen updates encouraging Backers to sue it,. it has now been put into showcase mode. We will now send out all the other pledges that have been processed through it. After that we will get in touch with you via the Kickstarter messaging system, if you haven't bothered to put yours through to find out what you want, because, sadly, we're not mind-readers and there was quite a bit of choice. Some of the items from the Kickstarter were exclusives and will not be on general release. Most of the items, however, will make thier way over to the regular Heresy shop as pre-orders and will be sent out as soon as spare stock is available. you can purchase them there as and when they appear, and they will be sent out when they are ready, after enough stock to deal with the pledges has been created. PLEASE READ THE FOLLOWING INFO CAREFULLY. It will save you emailing me with the questions answered below. 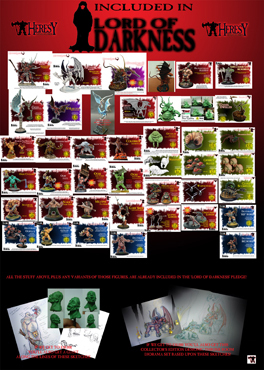 Feel free to browse, if you spot anything that is missing (eg weights of figures or pledges or missing pictures that it seems I haven't noticed) or seems incorrect, let me know so i can fix it using the Contact Us page, or the Kickstarter Project Backers' comments page, or the Facebook page, etc. IMPORTANT: THE SHIPPING DATES GIVEN ARE MASSIVE ESTIMATES. they were made before we really understood how much work we had on our plates. Due to the unexpected workshop move last year, which set everything back by at least two months, and then the Salute trade show in April, it is advisable just to assume that nothing will ship before July 2015, even though we'll be trying our hardest to get it all out before then! Bear in mind there are over 427 other orders to do as well as yours and someone has to go first. With luck it's yours but it might be someone else's! This is the special Pledge Manager Store for the Heresy Kickstarter. To use it you will need to log in (if you had created a customer account on the original Heresy shop prior to December 2014 it will be on here too) or register with a new account. Then simply choose whichever Pledge Level you originally chose during the Kickstarter, and add whichever Add-Ons you want. USE THE DROP DOWN MENUBAR ABOVE TO FIND THE CATEGORIES YOU WANT. Having chosen at least as much as you pledged for, checkout and then during the checkout procedure, enter the Discount Code that will give you the pledge you already paid last year as a credit against your order. you will need to pay for the insured, trackable shipping to your country so that your Rewards can be proven to have arrived as promised. The code is whatever your Kickstarter Username WAS IN DECEMBER 2014 (when Andy typed all the codes in by hand based on your username at the time and your original pledge amount) followed by the amount you spent in pence, including any capital letters, '/' marks or '_' underscores, etc BUT minus any spaces, and swapping any european accented letters for English equivalents, eg ö becomes o. And so on. If you still don't understand, feel free to ask! Please note: The code will only work once, so be sure you have used the full amount you have pledged for. If you want to add stuff to your pledge, you can either do it during this first order, or put another order in afterwards if you haven't decided what extras you want yet. Some of the Early Bird pledge levels on the Kickstarter couldn't be adapted to this Pledge Manager shop as you can't use more than one discount code at a time on the shop. So Andy has added an amount onto your discount code to compensate for the difference (eg £10 if you were an Early Bird Azaroth pledger and due an Azaroth kit for £30 instead of the £40 price). Just enter your original pledge amount and you will see that it gives you extra credit.